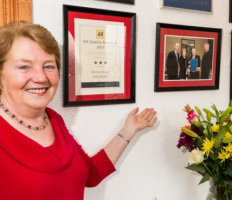 Bertra House is a unique 3 star B&B located in the tranquil and idyllic village of Murrisk, Co. Mayo, nestled at the foot of Croagh Patrick. Bertra House B&B offers 5 immaculate, bright and airy bedrooms. 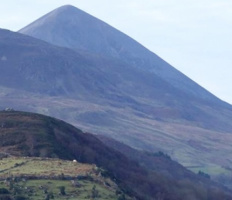 Our spacious twin room with spectacular views of CLEW BAY is equipped with TV, hairdryer, tea/coffee making facilities and private luxury bathroom. The elegant 3 double en suite rooms are also equipped with TV, hairdryer and tea/coffee making facilities. A large family room is also available boasting a double and single bed, TV, hairdryer, tea/coffee making facilities and a private bathroom. The private grounds of the B&B grant you the peace and quiet of the countryside. 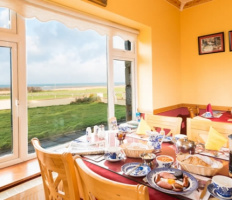 While the panoramic view of CLEW BAY can be marvelled at while you enjoy a buffet breakfast. 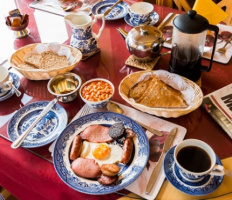 You can choose from fresh fruit, yogurts, and an array of cereals and freshly baked homemade breads followed by a hearty traditionally cooked Irish breakfast consisting of pork sausages, bacon, eggs, black and white pudding and tea/coffee. Why not enjoy a walk on the fabulous local beach which is only a 2 min walk from the B&B. Our location is the ideal base for you to explore the wondrous west of Ireland and all that it has to offer. Check out our local attractions page for some ideas.